© Provided by Fox News This Chrysler 300 was stolen, totaled after owner Jerry Ramirez, 18, stopped to help at a Texas accident scene. 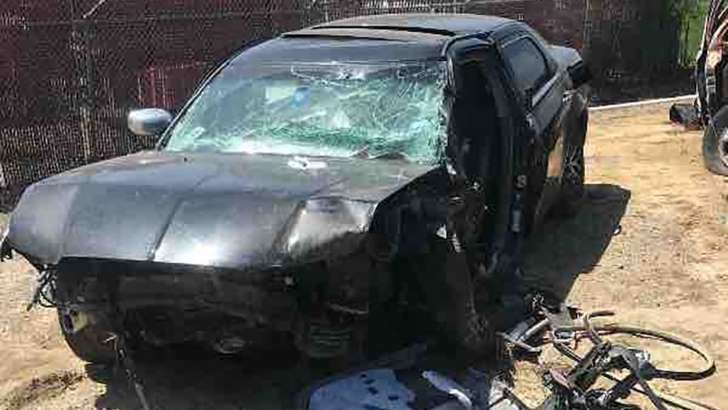 A Texas teen says his car was totaled after he stopped at an accident scene and it was stolen -- by the driver of the wrecked vehicle. High school senior Jerry Ramirez, 18, called 911 right way when he and friends came across the crash in Royse City last week, Fox 4 Dallas reported. The Rockwall County Sherriff’s Office said Delyn Stampf was operating a pickup truck when he lost control and struck a guardrail, the station reported. His three passengers were injured, including one who was thrown from the pickup. Ramirez told the station that as he and his buddies were waiting for police to arrive, Stampf, 29, took off in his car, a Chrysler 300. Police said a deputy responding to the scene chased after Stamp, according to the station. They told that station that eventually Stamp crashed the Chrysler in another town and was pronounced dead at the scene. Police said Stampf’s passengers in the pickup said they had been out drinking, the station reported. Ramirez is now appealing for funds online to purchase a new car. He said in his GoFundMe appeal that his insurance policy doesn’t cover theft, only liability. Still, he said if he sees another accident he probably won’t hesitate to stop. "I think I’d still pull over—just make sure I get my keys out of the car this time,” he told Fox 4. Click for more from Fox 4 Dallas.